Water colour reveals a lot about a sea or an ocean. Whilst many international salt-water bodies fall into the colour spectrum ranging from dark- to azure blue and turquoise, the Baltic Sea is marked by greenish water with slightly turbid conditions in most areas. This might make it seem less healthy and attractive at first glance since most people are naturally drawn towards crystal clear water, but this impression is partly deceptive. Despite being a sea of the Atlantic Ocean, the relative proportion of the two saltwater bodies approximately corresponds to the size difference between Switzerland and the Russian Federation. The only connection between the Baltic Sea and the ocean leads through the narrow Kattegat and Skagerrak waterways between Denmark and Sweden. Therefore, the level of salinity is evidently very low, along with being unequally distributed, with much higher concentrations in the western parts and an extreme decrease towards the north. Similar to paintings where the blending of yellow and blue produces green, fresh water containing mud from the rivers, wetlands, and vast bog and fen areas of the Baltic Sea drainage system add a yellowish component to the blue water shade. Organic materials further produce a high density of plankton containing chlorophyll, giving the human eye the perception of a greenish hue. Whilst plankton itself is known as the base of marine life and the green water indeed signals vitality, too much of it could be a sign of eutrophication and pollution. The Baltic Sea suffers immensely from excessive nutrient enrichment. Over-fertilization, the accompanying growth of algae and the lack of oxygen have already led to the creation of dead-zones on the seafloor. The replenishing water exchange with the North Sea, that provides salinity and an increased oxygen supply, takes around 30 years, making eutrophication the most critical area of concern for the Baltic Sea. The Baltic Sea also serves as a microcosm of marine and freshwater life that almost forms an observatory for scientists and citizens, allowing them to closely monitor the relationship and development of these two different forms of underwater life. 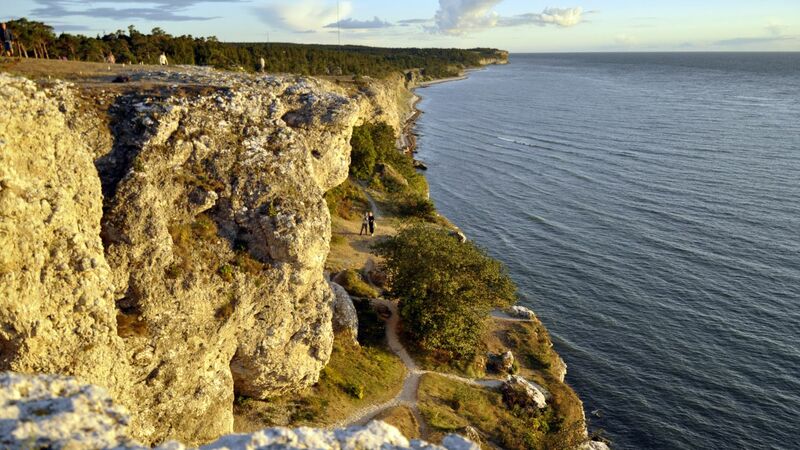 Considered the “youngest sea”, the history of the Baltic Sea only began around 10.000 years ago. Most marine species, dating back to a time when the level of salinity was considerably higher, have undergone complex genetic adaptations over the years and now exist without any connection to their conspecifics in marine waters. The sea can therefore also be seen as an “immigration sea”, whose inhabitants almost exclusively invaded from other water bodies. Due to this brief evolutionary period, there is only one known species endemic to the Baltic Sea: Fucus radicans (Algea). Saltwater species, such as the hermit crab and the mussel, migrated via the Kattegat from the North Sea. Freshwater species, including the fresh water sponge and the threespine stickleback, joined the Baltic Sea from rivers and populated the less salty parts in the northeast. Additionally, the Baltic Sea is home to many popular species such as marine mammals (harbor porpoise, ringed seal, grey seal, harbor seal), fish (salmon, sea trout, eel, pike) and waterbirds, which reside there constantly (herring gull) or during winter (long-tailed duck, little tern). However, rising temperatures associated with climate change are likely to affect the existing species composition.Whales and dolphins not usually occurring in the Baltic Sea have been sighted as temporary guests on numerous occasions throughout time, a phenomenon that has been increasing in the last decade. Apart from eutrophication and climate change, the sea’s inhabitants are mainly threatened by hazardous substances (wastewater, plastics, industrial waste, war ammunition), overfishing and immense shipping activities. The Baltic Sea creates identity, provides food, offers travel destinations, and brings employment opportunities for many of the 85 million people residing in its vast catchment area. Although its critical ecological state is mainly a result of its own features, human impact forms an additional pressure. Given its multi-layered meaning for all inhabitants within and around, as well as its uniqueness as an ecosystem, the importance of the Baltic Sea should not be underestimated. Cross-border cooperation and effective conservation actions on land as well as on sea are required for successfully preserving it and its functions for future generations. The Baltic Sea Conservation Foundation (baltcf) aims at addressing the most urgent environmental problems faced by the countries of the sea’s catchment area. By funding projects and supporting environmental organisations that address the portrayed challenges of the Baltic Sea, the foundation acts upon the strong belief that the future of the Baltic Sea is, though uncertain, highly promising. Therefore, the greenish water colour can be seen as a sign of vitality rather than weakness and even more so of hope. According to the ecological needs, the state and the importance of the Baltic Sea Region, we have developed funding priorities. Your project has to address at least one of those in order to be eligible for a grant. Please read our funding guidelines and statute carefully before sending a project concept. Would you like to learn more about the ecological features, socio-economic conditions and environmental impacts in the Baltic Sea region? Please look at the HELCOM report “State of the Baltic Sea”.